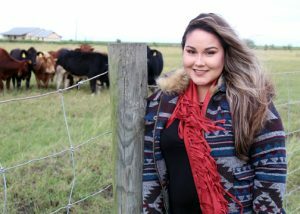 (HARLINGEN) – Jennifer Atkinson is an Agricultural Technology major at Texas State Technical College and boasts a perfect 4.0 grade-point average. The Rio Hondo native expects to earn her associate degree in Spring 2019, and when the 23-year-old is not in the classroom or out in the field she is busying doing community service with the TSTC Agriculture Club. After I graduate I plan on transferring to Texas A&M Kingsville to pursue a bachelor’s degree in Agricultural Science with a teaching certificate. My dream job is to have a successful career in agriculture with U.S. Customs and Border Protection. My greatest accomplishment so far has been making it on the Chancellor’s List and maintaining my honor roll worthy grades. I never used to be an “A” student so this has helped motivate to continue and appreciate school even more. The greatest lesson I have learned in life is that everything happens for a reason and in God’s perfect timing. All of my instructors and my classmates have had a great influence on my success. First, my instructors have been a blessing. They genuinely care about us, are easy to talk to and take every step necessary to ensure we succeed. Last but not least, my classmates. They have become lifelong friends and an extension of my family. My advice for future TSTC students is to work hard because nothing in life is handed to us on a silver platter.